When I first arrived in Australia, an early writing commission was to preview the expat playwright Ray Matthew's wonderful outback play, 'Spring Song'. It captured country values and setting perfectly – so well, in fact, that he was whisked off to the UK by Lawrence Olivier, never to return, and never to put on stage again such a successful evocation of anywhere else but Australia. Expatriotism is a double edged sword. Perhaps Tracey Moffatt has discovered some of its keenness? Hailed as “our Tracey” in New York where she created the exotic Orientalism of 'Laudanum', self-harmed in 'Scarred for Life' and created a series of brilliantly edited film snippets that captured the racism, sexism and crassness of Hollywood, she stuck it successfully for 10 years. Indeed, between 1997 and 2003, a show called modestly, 'Tracey Moffatt' toured 60 different venues around the world before coming 'home' to the Museum of Contemporary Art in Sydney. But the artist herself has now returned to Oz – though it's Sydney, not her mothership city of Brisbane she's chosen – and has, in the memorable words of Queensland Art Gallery curator Kathryn Weir been making work concentrating on “the suburb within” herself. 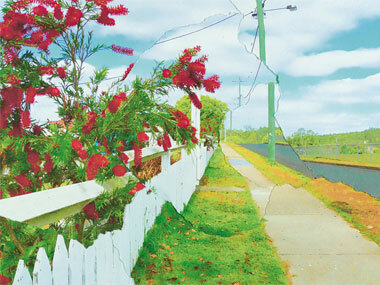 The QAG in Brisbane is showing this work under the highly appropriate title, 'Spirited'. Not only does it contain six suites of photographs called generically 'Spirit Landscapes', there's one group called 'Night Spirits' which is a quixotic attempt to capture the crying souls of massacred Queensland Aborigines in random night images – didn't she make a film called 'Night Cries' back in the 80s??? ; and then there's a nascent TV series called 'Art Calls' where the idiosyncratic spirit of the artist shines through delightfully. But that spirit is also sensually present in the series, 'As I lay back on my ancestral land' – where the vari-coloured clouds over her head are subtly intermingled with naked female forms. And the confident spirit with which she's come home couldn't be better represented than by the brave interspersing of other artists' work with her own – make what connections you may with Ian Fairweather, Bridget Riley, Arthur Streeton, Yoo Seung-Ho and Djambawa Marawili. Certainly Bill Robinson's ethereal cloudscape shows him matching Moffatt's sense of ancestral relationship to land and sky; Bridget Riley's colours are a mate for the water crayon writing superimposed on her deliberately dull 'Suburban Landscapes'; and the black, surreal Yves Tanguy (with the wacky title, 'Dung on the left, violets on the right'!) adds to the bleakness of her 'Night Spirits' series. But I question the links between Moffatt's 'Pioneer Dreaming' prints, which juxtapose the faces of Hollywood's unlikely cow-girls with hand-ochred landscapes, and Djambawa Marawili's 'Baraltja' bark, showing the snake which sends forked lightning into the tropic skies of Arnhemland from his waterhole habitation. So, one's mocking a connection with the land, while the other is utterly dependant upon it. I think my favourite series is 'Picturesque Cherbourg'. No, we're not in France beneath umbrellas! This misnamed township in Queensland was the home of many a displaced Aboriginal family – a place of pain and detribalisation as they were deliberately separated from their Country. But that pain is only apparent in Moffatt's works through their torn and collaged construction. For she's chosen the most brilliant of colours and bright white picket fences as her subject-matter to emphasise the resilience of the residents dumped there through much of the 20th Century. And the 'Picturesque' of the title is a reference to Eugene Atget's 'Picturesque Paris' photo-series from the end of the previous century, where he was revealing how modernisation had effected working class Parisian lives. And then there's 'Art Calls' – a literal description of the filmed Skype interviews she's done with a dozen arty people. What's so delightful is the split screen used to show both sides of the interview as she asks unexpected questions and her callers respond. Oh, and a lady called Sandy 'interprets' various artworks in the Art Gallery of NSW! I have to admit that I'd heard only of Jenny Kee (designer), Destiny Deacon and Clinton Nain (brother and sister artists, who play up outrageously) and Jan Billycan (star Bidyadanga artist – from whom little is gleaned apart from her hunger for lunch and a nice little song!). But American artists Deborah Kass and Franco Ruiz gave best value in catching the mood of their wayward interviewer, emanating from – would you believe – a remote studio in Ipswich, who took on the appearance of a fairground fortune teller with gay abandon! It may well not make it to free-to-air TV – but can be discovered in its current entirety on the ABC's website. Will the combination of artshow, catalogue and film convince you that Tracey Moffatt is “arguably the most prominent Australian artist exhibiting nationally and internationally today”, I wonder, as QAGoMA Director Chris Saines would have us believe in the exhibition catalogue?